I spoke with a bride today who is having a problem creating her wedding budget. Her fear is setting her budget to low or overspending. Like most couples their concern is to be able to pay their living expenses long after the wedding. As a planner I truly understand their concerns, however creating a budget is not an exact science, but there are things you should consider that will make settling on an amount much easier. 1. Sit down as a couple and define the type and style of wedding you want. Do you want a simple cocktail reception or seated dinner? 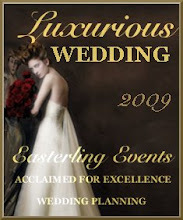 Do you have a venue in mind? Do you have a theme in mind? What about the number of guests? 2. Review your current financial situation and personal budget and decide on an amount that is AFFORDABLE to you. Know your limits! You may only be able to afford $6,000 and that’s ok, however you need to be realistic and flexible. You may found out you can’t always get what you want, but most vendors are willing to work with you and offer an alternative solution. 3. Keep an account of your spending. The best way to track spending is to open a dedicated bank account for your wedding expenses. If family or friends are helping you pay for the wedding collect the money upfront and deposit it right away. Remember you cannot plan a wedding on a promissory note. 4. Define your must haves for your wedding? Open Bar vs. just wine or juice. DJ/Band vs. iPod station. Knowing you must haves will help you focus on the things that matters and stay away from things that don’t. That said don’t be afraid to hire a planner. Their job is to help you stay within your budget and connect you with vendors that are willing to work you.